Now that the weather’s warming up, let’s go to the drive-in. Nothing says car culture like a drive-in movie. Above is an ad for the Air-Line Drive-In in Chicopee, Mass. from May of 1950, featuring Humphrey Bogart in “Tokyo Joe” (1949). The excellent Cinema Treasures site notes that this drive-in was built in 1952 (obviously an error if the ad is from two years earlier), and closed in 1984. 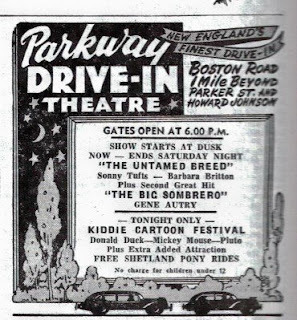 Another great website “Drive-in Movie.com” notes that Massachusetts had one of first drive-ins ever to open, the Weymouth in 1936, and during the peak years of the 1950s had 90 drive-in theaters. This astounds me considering our winters. Not only are drive-in theaters of necessity, seasonal, here, but must surely have required a great deal of maintenance in the spring after six months of weather havoc. Only about five remain in the Commonwealth today. The ad boasted that the Air-Line had the largest screen in America, but I don’t know if that’s true. The second feature was “Make Mine Laughs” (194) with Ray Bolger, Dennis Day, Joan Davis, and Jack Haley. 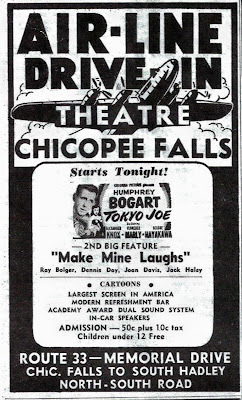 On this day while you could see Humphrey Bogart at the Air-Line (so named for the thunderous military planes flying over from the so-close-you-could-spit-and-hit-it Westover Air Force Base), you could drive the family car over to Boston Road in nearby Wilbraham instead to the Parkway Drive-In (only a mile down the road from a Howard Johnson’s restaurant, yum) and see “The Untamed Breed” (1948) with Sonny Tufts and Barbara Britton in a double bill with “The Big Sombrero” (1949) with Gene Autry AND free Shetland pony rides for the kiddies. According to the Cinema Treasures site, the Parkway opened in 1948 and closed in 1987. Another source for information on drive-ins is this site at Drive-ins.com. What are your memories of drive-in theaters? To start the ball rolling, I recall sitting in the back seat with my twin brother, both in our jammies, reaching over the front seat for popcorn and watching the movie between our parents’ heads. We saw “With Six You Get Egg Roll” (1968) with Doris Day and Brian Keith, and “The Boatniks” (1970). My brother, John, remembers there were two cartoons, “Tiger Trouble” (1945) with Goofy, and “Donald’s Ostrich” (1937) with Donald Duck. I don’t remember these, but then, he’s the cartoon guy. This must have been the summer of 1970. I faded out halfway through the second one, which I think might have been “The Boatniks”. When I was a child growing up, I can remember that if we saw any of our friends in the neighborhood walking out to their cars after suppertime in their jammies and bathrobes and slippers, carrying pillows, we knew they were going to the drive-in. I always thought one of the most haunting sights is an abandoned drive-in. The huge screen shredded by wind and the elements, the clumps of grass growing between cracks in the asphalt, the posts for the speakers standing sentinel, rusting. Like an Old West ghost town, eerie. Do you still go to a drive-in near you? Oh I've never been to a drive-in! Even though there is one in Mendon, MA (nearby town to where I grew up) and from that Drive-In website it seems like it's still open. I'll have to make some excuse and go before they close it forever. I agree that the MA drive-in phenomenon doesn't make much sense giving our harsh winters and our crazy weather in general. But then again MA is weird like that (we have 3 out of the nation's 5 agricultural high schools! why?!). Great post-- my first memories are an animated feature called either the Ice Queen or the Snow Queen-- can't remember which-- & which I believe positively terrified me-- & Ben-Hur! There was a drive-in on the north side of Bellows Falls, probably in the Rockingham, VT township. Haven't been to a drive-in in many years, but there is a working drive-in a Parma, Idaho, about 100 miles from here, & Eberle & I have thought of going to that. Interestingly, in terms of your thoughts about winter, Parma is low-lying & has quite a mild winter-- very little, if any, snow. Hi, Rachelle, thanks for stopping by. Definitely go to the drive-in in Mendon. I want to hear about it on your blog this summer. As for the agricultural high schools in Mass., probably because there is a long and very early established tradition here of yeoman self sufficiency, and the nation's first public school system where children were not merely allowed to attend, but by law required to attend. Massachusetts is also possibly a bit more rural than some might realize. We don't have huge commercial farms, but small family farms are everywhere. Come out west of Worcester. UMASS-Amherst used to be the Massachusetts State College of Agriculture until only a few decades ago. John, thanks for your memory of Ben-Hur and the scary cartoon. That's just great. I hope you and Eberle get to go to the drive-in in Parma sometime. Take Raquelle with you. I have a very early memory of seeing a double bill of JUNGLE BOOK and BLACKBEARD'S GHOST at a drive-in. I was roughly 5 at the time. Like you, I have memories of going in pajamas! I know I saw a couple other films at a drive-in but can't recall the titles. I think one was TRUE GRIT (wherever I saw it, the rattlesnake scene scared me to death). The big drive-ins around here were the Lakewood, the Los Altos, and the Highway 39, which didn't shut down until the late '90s. Hi, Laura, and again, welcome back from your trip. I love the travelogue from the UK and Paris. Thanks for sharing your memories. 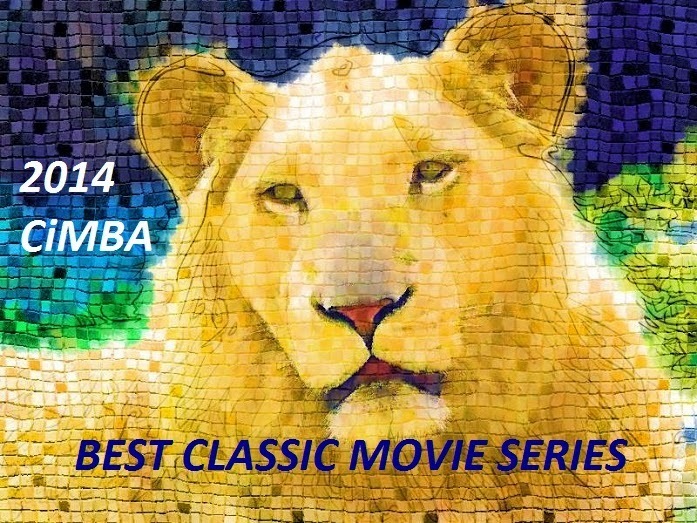 Oooh, "Jungle Book." Thanks also for the links to those drive-ins you mentioned. They all seem to have shut down in the late '90s for K-Marts or Wal-Marts or Lowe's. Are there any drive-ins in your area now? And also, I wondered how long was the drive-in season in southern California? I believe it lasted three months, maybe a tad longer in New England. I'd also like to know from anybody who is familiar with the drive-ins of south Florida, how long was their season? I'm just wondering if it was uniform over the same summer months all over the country, or if some areas of the country enjoyed a longer, or perhaps even year-round drive-in movie season. I believe the Highway 39 was the last drive-in left in the area before it made way for Wal-Mart and Lowe's. That was the one closest to my house. If I remember the drive-in name & location correctly, the Los Altos screen could be seen from the 405 (San Diego) Freeway...I remember looking over when we drove by at night trying to figure out the movie playing. As far as I can remember, drive-in theaters operated here year-round. They started later in the summer, when it got dark later; I have a vague notion that perhaps they had multiple showings during the winter, when it was dark longer at night. Wow, year-round! Interesting. Well, since it was old man winter that killed drive-ins in the northern states for the most part, why are they going out of business in a part of the country where they can enjoy year-round revenue? Is it because the property is still more valuable sold to a major chain, which is probably eager to purchase a large parcel with very little already on it to clear? Weather was only one of the factors in the demise of the drive-in, Jacqueline. Southern states had to contend with summer humidity; some enclosed theaters installed air-conditioning to compete with the drive-ins. A blogger named Jay Wertz mentioned that in a blog he's doing about the history of the drive-in. Personally, I didn't get to experience drive-ins much until I learned how to drive because my parents never owned a car, but they are a special experience. I keep saying I'm going to one of the drive-ins near Nashville, but I haven't yet. By the way, the music on this Website is really a nice touch. Welcome, Gerald, and thank you so much for adding more info to this discussion. I never considered summer humidity in the Southern states, but I can see where that would be a factor. I'll have to check out Jay Wertz's blog. Thanks for your comment on the music. I was afraid it would annoy readers, that's why I note at the top of the blog the option to mute it. I love drive-in movies. We usually go for the dusk to dawn shows on the holidays. They usually have them on Memorial Day, the Fourth of July, and Labor Day. Here's a link to a page I put together on drive-ins. 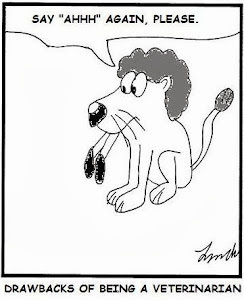 Welcome, fugeecat, and thanks for the link to your page on drive-ins. So glad you still enjoy them. So many have lost the opportunity in the areas where they live. I'm lucky there are three within driving distance.